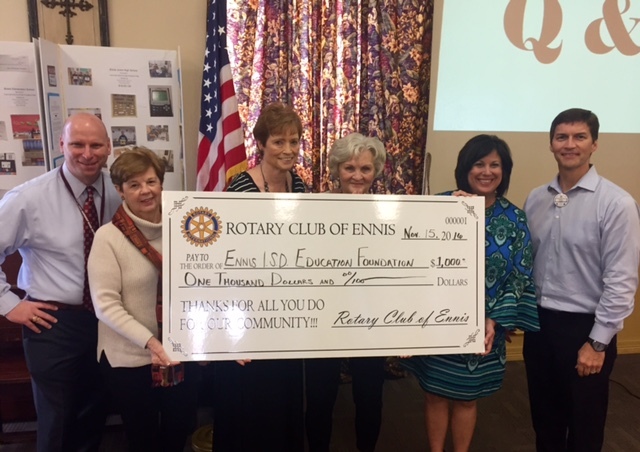 The Rotary Club of Ennis was proud to present a donation to the Greater Ennis United Way at a recent club meeting. 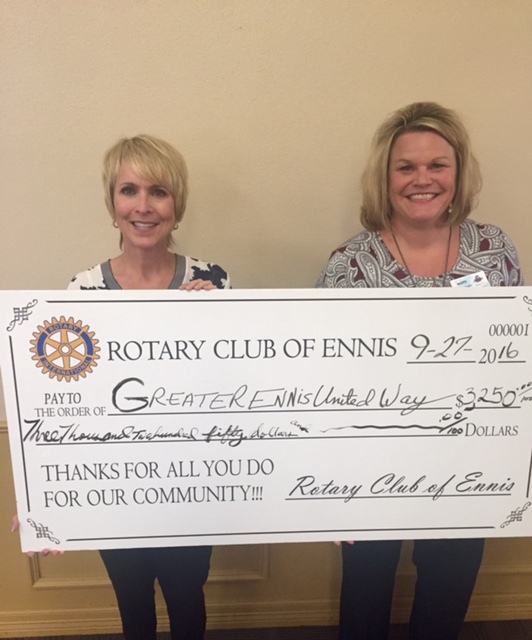 Pictured are Brenda Haupt, Co-Chair of the Greater Ennis United Way Campaign and Misty Culpepper, President of the Rotary Club of Ennis. Thank you to all the volunteers and staff of the Greater Ennis United Way for the all that they do for our community! Live United! The Rotary Club of Ennis was proud to be able to send 4 students to Camp RYLA this year. We always hear how wonderful this camp is and the students always thoroughly enjoy it. As pictured left to right – Romario Gutierrez, Ennis High School, Alex Johnson, Ennis High School, Steve Huff, Rotarian Youth Advisor, Yesenia Muniz, Ennis High School and Savana Rogers, Palmer High School. 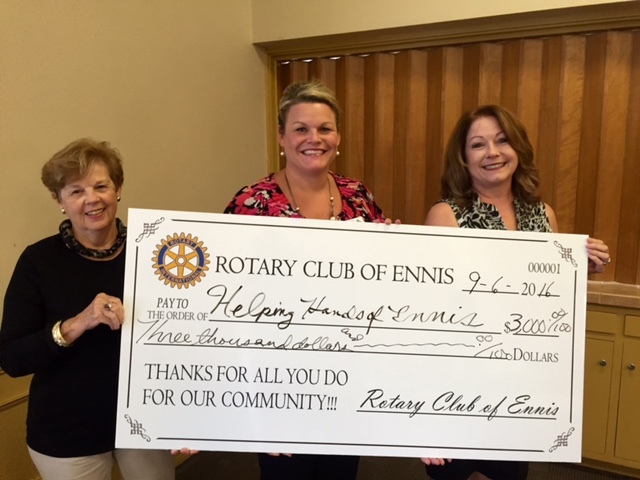 The Rotary Club of Ennis is proud to help provide support to Helping Hands of Ennis. Helping Hands board member Ginger Board and Executive Director Judi Hejny recently attended a Rotary meeting to accept a check from Club President Misty Culpepper. Thank you to Helping Hands for the wonderful needs they fill in our community. 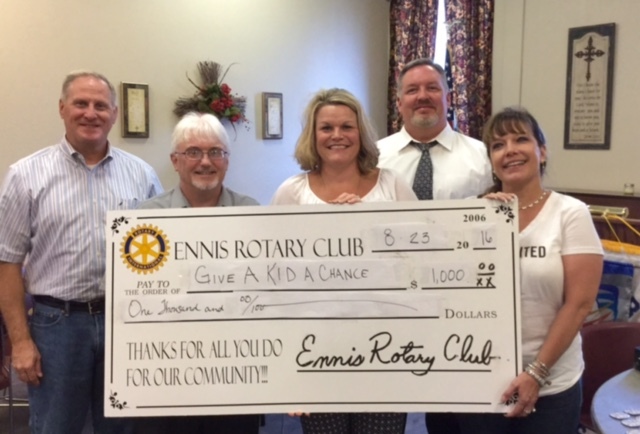 The Rotary Club of Ennis is proud to help support the needs of Give A Kid A Chance. The club was recently visited by Marty Nelson with Give A Kid A Chance where he accepted a donation from the Rotary Club of Ennis and informed club members of ongoing efforts. 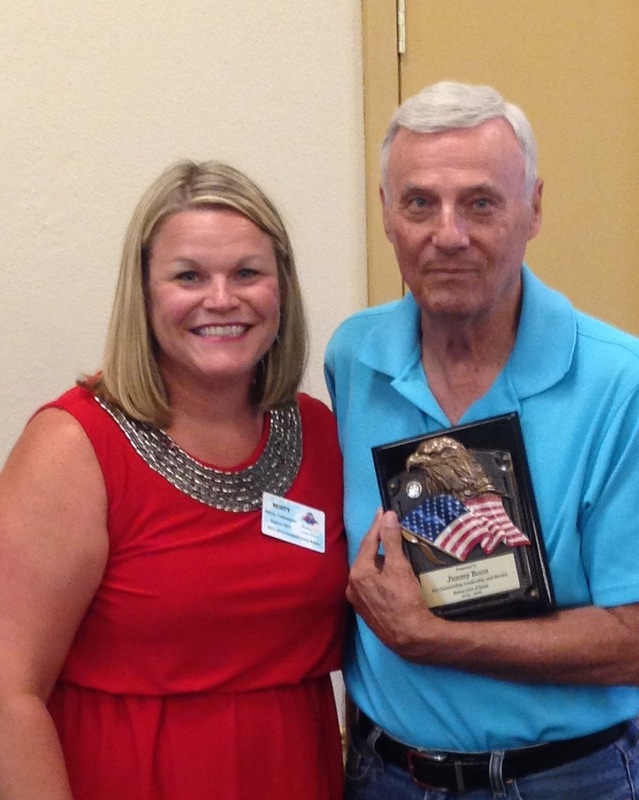 A special thank you to Jimmy Boon for his countless hours he has devoted to the flag program for the club. We cannot thank him enough for what he has done for the club and for our community! Thank you for taking a few minutes of your time to visit the Rotary Club of Ennis. Our club is full of wonderful members who exhibit service above self in all ways! I encourage you to come visit us on any Tuesday at noon to see what we are all about.